DTW Senior Project Manager Theresa Samosiuk notes that the $110 million undertaking was blessed with good weather and an excellent team, with both helping the project come in under budget and ahead of schedule. "Our airfield infrastructure is critical in providing safe and efficient operations here in Detroit," says Tom McCarthy, vice president of facilities, design and construction for the airport. "We had tremendous support from our partners, and our team worked very hard to complete this project in an innovative and efficient manner. Our strong partnership with officials at our local FAA Airport District Office was instrumental in the project's success." Geotechnical Investigation & Quality Insurance Testing: CTI & Assoc. Constructed between 2000 and 2001, the surfaces of the existing runway and taxiway pavements were rapidly deteriorating due to alkali silica reactivity, a well-documented condition experienced by many roadway and airfield pavements constructed during that time period, informs Samosiuk. "Between 2014 and 2015, we performed nearly $5 million in runway repairs," she elaborates. "Temporary repairs like that are not cost-effective or sustainable." Design and reconstruction work for the project required aggressive scheduling. The airport awarded RS&H the engineering and design contract in 2014, with the requirement that the 10,000-foot runway and associated taxiways would be reconstructed during a single construction season in 2016. Pavement reconstruction included Runway 4L-22R; Taxiway A and seven connectors; the end-around Taxiway Q, which added another 5,000 feet; and a small portion of Taxiway V. (A small paving project on Taxiway R is scheduled for 2017.) Crews removed the existing Portland cement concrete that was deteriorating and replaced it with 18.5 inches of similar new material. They also rebuilt the bituminous shoulders and installed new stormwater and underdrain systems. High-intensity LED runway edge lights were added along with standard LED runway centerline and touchdown lights. Crews also upgraded taxiway edge lighting, centerline lighting and signage with LED fixtures. All told, the project required 600,000 cubic yards of excavation, 445,000 square yards of Portland cement concrete, 220,000 tons of asphalt and 150,000 linear feet of 6-inch underdrain. Given its large scope, timing was no small factor for the project. Contractors had to complete the project within the April to November 2016 construction season to ensure that the west side of the airfield could resume operations for the winter season. If this did not happen, Samosiuk explains, DTW would be limited to using just three parallel runways (two runways during snow removal events), which would constrain airfield operations. For a project of this magnitude, on such a tight schedule, it was critical for contractors to have easy access to the work site. Because the runway sits on the far west side of the airfield, contractors were able to isolate the site from active airfield areas by installing three miles of temporary 10-foot security fencing during an enabling project in 2015. Securing the work area as a landside project facilitated access and reduced security and insurance requirements for contractors. During peak construction periods, more than 300 workers were on site at a time, Samosiuk informs. "The fence was a huge help in getting this done as quickly as we did," she notes. "I heard some contractors say that a project of this size might have taken two or three years to complete if they had to deal with all the security requirements related to performing construction on an active airfield." The result was an extra-busy worksite, with concrete demolition in one area, underdrain installation in another, and asphalt and concrete placement elsewhere-all occurring simultaneously. "At the beginning of construction, you could drive from one end of the project to the other-about three miles-and it seemed like there was activity on every square foot of space," recalls Samosiuk. "It's just not what you typically see with airfield reconstruction projects, where you're generally limited in space and what you're able to do. It was very exciting." The initial design called for demolishing and removing the surface pavement, milling off the top 3 inches of asphalt base material, and then replacing all materials in kind: 3 inches of asphalt topped with 17 inches of Portland cement concrete. The design team evaluated the condition of the existing bituminous base material and deemed it to be in good condition. The initial assumption was that demolition would not damage the underlying base, informs Pat Frame, Michigan aviation leader for RS&H. Nevertheless, engineers used a falling weight deflectometer to verify the condition of the base material after concrete demolition. While engineers expected the resilient modulus of the bituminous base to be 400,000 psi, readings came in at 150,000 psi-significantly lower and outside FAA design requirements. "To remain on schedule, we had to quickly modify our pavement structure to provide adequate support for the design fleet," recalls Frame. Contractors consequently increased the amount of material milled from the base course and made up the difference by increasing the amount of Portland cement concrete they poured on top. "We went from a 17-inch concrete section to an 18.5-inch section," Frame specifies. "We did that throughout the entire runway and taxiway system." Setting up two batch plants and a concrete crusher on site helped the contractor keep pace with production needs. What to do with the old concrete, which was laden with alkali silica reactivity, proved to be a significant issue, Samosiuk notes. "We wanted it off our property," she adds emphatically. "We didn't want to reuse it on the shoulders, so we worked with the contractor to find another solution." The airport limited onsite crushing to the quantities committed to other projects in the area, and the contractor removed the remaining concrete materials to its local yard a few miles off airport property. DTW's new runway and taxiways were designed to accommodate the Airbus A340-600, per FAA runway design code D-V and taxiway design group 6. "All of the geometric aspects of the runway and taxiway system were modified to meet current FAA design standards," says Frame. "This affected the pavement intersections and the width of the paved shoulders. The new design standards provide for a more economical geometry for the newer aircraft." In addition, the geometry of existing high-speed exit taxiways did not meet current FAA geometric requirements. Because the taxiways required full reconstruction, the design shifted the location of the taxiways, replacing the 45-degree connectors with full 30-degree high-speed exits. "This reconfiguration allows airlines to land more planes, increasing the capacity of the runway and making operations more efficient," Samosiuk explains. "It also translates into fuel savings, as aircraft are able to get off the runway more quickly." Wayne County Airport Authority demonstrated its ongoing commitment to sustainability many ways during DTW's recently completed airfield project. Various measures focused on reducing lifecycle costs, increasing contractor efficiencies, decreasing emissions and fuel consumption, and diverting materials from landfills. In addition, team members scheduled truck hauling during the night to reduce road congestion during peak daytime hours. The extra efforts extended by the project team paid off. In September 2016, the authority proudly accepted the Envision Silver Award from the Institute for Sustainable Infrastructure, which recognizes sustainable infrastructure based on its full range of environmental, social and economic impacts. The runway project is the 19th project in the country to receive an Envision rating. C&S Companies led the sustainability efforts and managed the process for Envision recognition. Personnel began with a sustainability charrette that involved a cross-section of airport authority representatives and the project team to establish priorities, challenges and opportunities specific to the airport and the project at hand. Attendees evaluated potential strategies to generate recommendations that would provide value to the project and also prove feasible to implement. Even though FAA does not fund high-intensity LED runway edge lighting, DTW opted to install them throughout the project to save energy, reduce maintenance costs and reduce disruptions to tenant operations. Executives from the project's electrical engineer praise the authority's decision to move forward with the LED installation. "Not many airports have full LED installations on runways," notes Nick Ryan, vice president at Arora Engineers. In total, crews installed more than 1,300 LED lights and 72 miles of airfield lighting cable on the runway and taxiways in seven months. "Having it as a landside project was key to getting it done on schedule," says Ryan, echoing Samosiuk's sentiment. 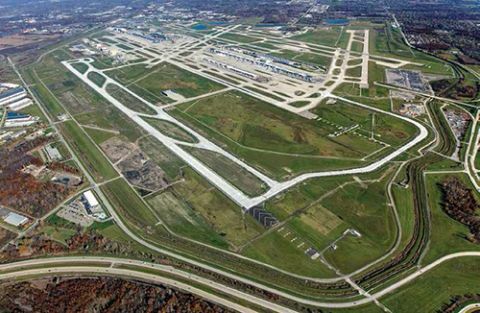 For environmental purposes, DTW required the concrete and asphalt contractor to track all materials and waste generated, and submit monthly reports to the airport and engineer. Ajax Paving exceeded the initial target of 85%, and diverted nearly 100% of potentially recyclable construction, demolition and land-clearing materials from landfills. When all was said and done, nearly 3.3 million tons of material was recycled/reused offsite, and almost 3.5 million tons was recycled/reused onsite. In addition, approximately 75% of the water used on the project (nearly 11 million gallons) was drawn and repurposed by pumping stormwater from collected reserves. Bob Koller, department manager of aviation for C&S' Great Lakes Region, reflects on theses accomplishments: "It's big. We calculated that 99.8 percent of all materials were diverted from landfills. Most of the soils remained onsite, but other materials such as concrete and asphalt pavements were removed to a recycling yard for use on other projects. Rather than using potable water from local water sources, the contractor hooked up to an airport pump station, using stormwater for dust control and base course compaction. The fire hydrant at the end of the runway was tapped for the potable water needed for the new concrete materials." DTW is only the second airfield project and third airport project to receive an Envision award, notes Koller. In addition to recognition for its sustainability efforts, the airport authority also received an Award of Excellence from the Michigan Concrete Association and an Award of Merit from the Asphalt Pavement Association of Michigan for the outstanding quality of the concrete and asphalt placed during the project. "It all comes down to planning, teamwork and creativity," reflects Samosiuk. "With a great team, willing to work together, you can accomplish anything." FAA Airport Improvement Program discretionary grants paid for 20% of the project's cost, and general airport revenue bonds funded the remaining 80%. DTW also applied for and received an FAA cold weather construction provision, which allows airports with short construction seasons to submit project reimbursement requests prior to the execution of AIP discretionary grants. "Typically, FAA grants are awarded late summer. With our climate, it is impossible to complete a large project that late in the season," explains Samosiuk. "Receiving permission to proceed with construction before receiving the grant money allowed us to begin the project in April and maximize our construction season." DTW was one of the first airports to apply for the provision, during another project a few years ago. Samosiuk praises the project team-contractors, consultants, municipal partners and the airport authority-for all the thought and effort that made the project a huge success. "Project managers sometimes spend a lot of time focused more on the project challenges, rather than the opportunities," she reflects. "I believe we really went above and beyond the typical planning for a project like this. We planned for a one-year construction and had contingency plans for situations beyond our control. Between the runway and taxiways, we reconstructed over six and a half miles of airfield pavement. Fortunately, we didn't have to implement any of those backup plans.